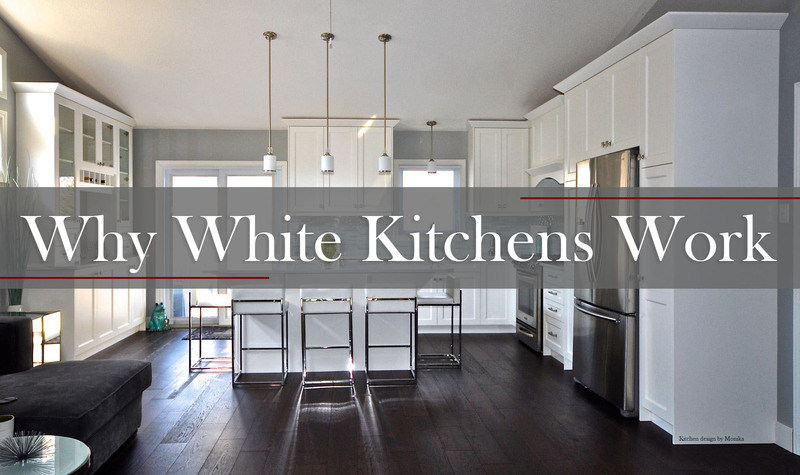 Kitchen fads will come and go, but if you want something that will stand the test of time, a white kitchen is the way to go and here’s why. If your ready to remodel your kitchen, then your ready to drop some serious cash and you don’t want to drop it on something that will end up disappearing faster then sour milk down the drain. White kitchens stand the test of time because they are “fresh and clean” and there isn’t a better way to approach design other than that. As the brightest colour, white reflects light and makes even a small kitchen feel and look spacious. Flash back to the 1920s, white was just about the only colour offered by kitchen manufacturers. White is marketable! The Home Appliance Manufacturers Association says white appliances have outsold all other colours and the same goes for cabinets. White almost always tops the list in most popular kitchen and baths annual surveys, which is great news when it comes to resale value. The simple beauty of white kitchens takes the worry out of marketability. Think white cabinets are too boring? No way! Cabinet doors and trims create incredible details and dimensions of contrast that give depth and interest to your cabinets. Don’t forget, every colour looks great paired with white! Think of all the fun you can have decorating and making your kitchen come alive. White kitchens let you be you! Think of an art canvas, it starts off as a perfect white backdrop for your favourite colours. Paint the walls, add open exposed wood shelves, anything you imagine can come alive.